In the New Rule window, on the General tab, type Alter emails to black & white (or any descriptive name you like) into the Rule name textbox. Note: If you want this Rule to apply to all users, then choose All users from the dropdown. There will be no need to apply this Rule to users. Show on printer panel: When they release an email print job they will see a message. Popup on user’s workstation: If the user has the PDAgentClient application installed on their workstation, they can get a popup when they print an email in colour. Choose the Colour printing will incur a violation option. Now click the Document Names tab. Change the option to Document names that match one of the following search parameters will incur a violation. 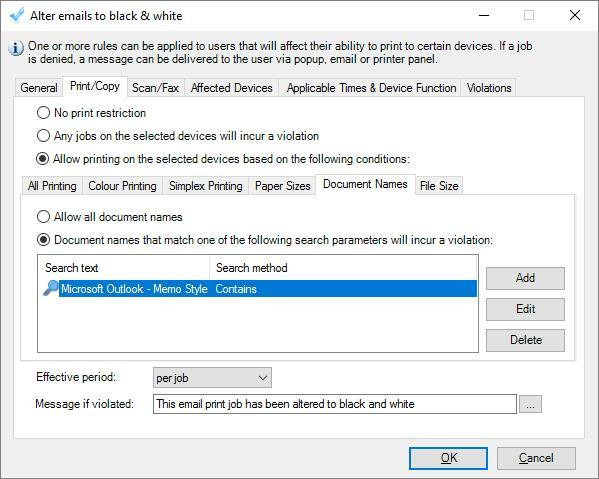 Enter Microsoft Outlook – Memo Style in the Search text field. Add any other document name matching items if other applications are used for printing emails.